Perfect short zara jacket stunning on size s.
Zara Basic Orange 3/4 Mac Size Large but small sizing so I would say UK 12. I literally wore this once so in excellent like new condition. Major wardrobe clear out so bag yourself a bargain! From smoke free home. Freshly laundered & ready to go. Dispatched with Royal Mail Signed For® 2nd Class. Zara woman camel trench coat Mac size M uk 10. Chest 38”, length 29”, sleeve 25”. 2 sides pockets, belt. Stylish coat in Excellent condition Any questions please feel free to ask. Please take a look my other items for sale. This is a lovely smart coat. We are a smoke and pet free home. Please check out my other items for sale. COLOUR BROWN. LINING 100% POLYESTER. OUTER 65% COTTON 35% NAYLON. LENGTH 82cm / 32in. SLEEVES 61cm / 24in. WAIST 92cm / 30in. Zara Trench Coat - Removable Hood - Navy Blue - Black Trim - Faded Look. 18.5" across chest. Size Large which is a size 14. Wide, peacoat style. ZARA Beige Trench Coat. Pleated back of item with button detail. Pleated bustle area at the rear. Zara Woman Trench Coat Mac. Button up front - double breasted. Condition: In very good pre-worn condition. There is a mark on the back of thee coat (see picture 11). ZARA BASIC Trench Jacket in Beige/Sand Colour Size M. Used once only in very good condition. Very nicely finished! Thank you for watching. Zara oversized trench coat with a lapel collar long sleeves with tabs on the cuffs, a back vent at the hem and double breasted fastening. 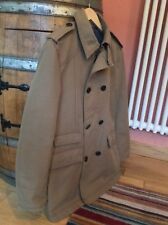 In good condition trench, mac jacket. Not visible when wear. Labeled like size M and presented on model in size UK10. Length (shoulder to hem)58.5 cm ( 23 in). Sleeve Length (pit to cuff)47.5 cm (18.75 in). 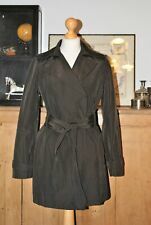 Zara woman Black belted trench coat double breasted size uk 12 L 34"
Sleeve length 23. Armpit to Armpit 18. length 34.5. New ZARA FAUX FUR WAISTCOAT Truly I wish I could of kept it but can't coz of baby due soon Really gorgeous looks like Real fur . SIMPLY GORGEOUS STYLISH WAISTCOAT WITH HOOK/EYE FASTENING TWO SIDE POCKETS No returns please MEASUREMENTS ARMPIT TO ARMPIT 20" LENGTH 27"
D778 WOMENS ZARA BASICS BLUE DOUBLE BREASTED SHORT MAC JACKET UK M 34"
PIT TO PIT 17". LENGTH 25". WE HAVE LOADS MORE LOTS COMING ON IN THE NEXT FEW WEEKS. REF ZACLOTHING. Zara cream trench short coat jacket belt missing. Stylish trench coat. In excellent condition. All buttons are completed. Comfortable pockets on breast line and on the sides fastened by button. Labeled like size M and presented on model in size UK 10. Stylish belted trench style open jacket from ZARA. 100% Polyester outer. 100% Polyester satin lining. Sizes available. Be sure to add us to your favourites list ! Lovely Coat. Also colour is subjective and can be affected by the settings on a computer or the lighting used when photographing. Lovely Short jacket Coat by Zara Basic. Size EU Large. Great coat for the spring. Prices quoted are for mainland UK only. Hardly Worn and In Excellent Condition. Ladies coat from ZARA. military reefer jacket look. size S uk 10. big buttons contrast. BLOGGERS FAV! ZARA CAMEL LIGHT BROWN SHORT CHECKED PLAID TRENCH COAT, SIZE S.
AS SEEN ON GWEN STEFANI AND MANY FASHION BLOGGERS! ZARA SHORT CHECK TRENCH COAT. COLLARED TRENCH COAT WITH A DETACHABLE HOOD. OUTER SHELL - 100% COTTON. SIDE VENTS AT THE HEM AND DOUBLE-BREASTED BUTTON. 3 button hole positions so can adjust fit/ wear in different ways. However, weekend collections are usually available. 19.5" across chest. Hip length light pink trench coat with pleated back. Good used condition. One button needs tightening. Zara Trench Coat 100%Genuine & Authentic Zara Item. Zara Trench Coat 100%Genuine & Authentic Zara Item. Dispatched with eBay delivery – Shutl 2-3 days. ZARA BLACK SHORT TRENCH COAT AW 2017/18. BNWT SIZE S.
Color can be little different from photo. Ladies Cream Coat From Zara, Size Medium. Condition is Used. Dispatched with Royal Mail 1st Class.
" ZARA"Woman'sRedPure Cotton Utility Jacket with pockets. RRP £65 Bargain! Stylish, luxurious, fashionable jacket, made from soft heavy cotton. Long sleeve. Dress it up, dress it down-perfect for any occasion.You will love it! Khaki green collared coat. Long sleeves, navy wool style sleeve. Casual Coat. Military style jacket. Full zip with detailing. LADIES ZARA BEIGE BELTED JACKET/MAC WITH REMOVABLE LINING AND HIDDEN HOOD SIZE LARGE. I would say that zara clothes tend to be more on the smaller side so I would say that's it's more a size 14 than a 16. How to wash: Machine wash max 30 ° C, Do not bleach, Iron up to 110 ° C/230 ° F, Do not Tumble dry. Material: Polyester 100% Outer Shell and Lining. Pattern Type: Solid. Style: trench. Basic info Fur type: -. Season: spring. Bank account details Total length ca. Length: hip length. Size Type: regular. ZARA TRENCH LIGHT COST JACKET. GATHERED/ RUFFLE SLEEVES. KHAKI SZ S is AVAILABLE. ZARA TRENCH LIGHT COST JACKET. GATHERED/ RUFFLE SLEEVES. IVORY/BIEGE OR KHAKI ARE AVAILABLE. sz S and zM. Style: trench. Fabric content: 60%wool 28% polyeter 6% viscose 2% cotton 2% nylon 2% acrylic. Material: wool blend. Basic info Fur type: -. INT EU Short Long UK US. INT EU DE UK F IT US US. Total length ca. Style: trench. Basic info Fur type: -. INT EU Short Long UK US. INT EU DE UK F IT US US. S 46 23 90 36R S. L 40 40 12 42 44 10 M. XL 54 27 106 44R L.
Style: trench. Fastening: double breasted. Basic info Fur type: -. S 46 23 90 36R S. L 40 40 12 42 44 10 M. XL 54 27 106 44R L. 3XL 46 46 18 48 50 16 XL.